A lot of buzz has been building around the upcoming Exchange Rates, and it is finally here this week! The international expo is an entirely new model for Bushwick, bringing galleries from all over the country and the world to share in the artistic zeitgeist of Bushwick. The partnership between the expo's Bushwick organizers, Stephanie Theodore of Theodore:Art and Centotto's Paul D'Agostino, and the London-based indie Sluice Art Fair, can be traced back to a year ago, when several Bushwick-based galleries participated in Sluice 2013. The London expo, modeled as an alternative to the mall-like atmosphere that many contemporary art fairs adopt today, was meant to be a breath of fresh air, creating a sense of community rather than a shopper's paradise. It was with this mindset that Theodore and D'Agostino worked throughout the last year to bring this same spirit with to Bushwick. 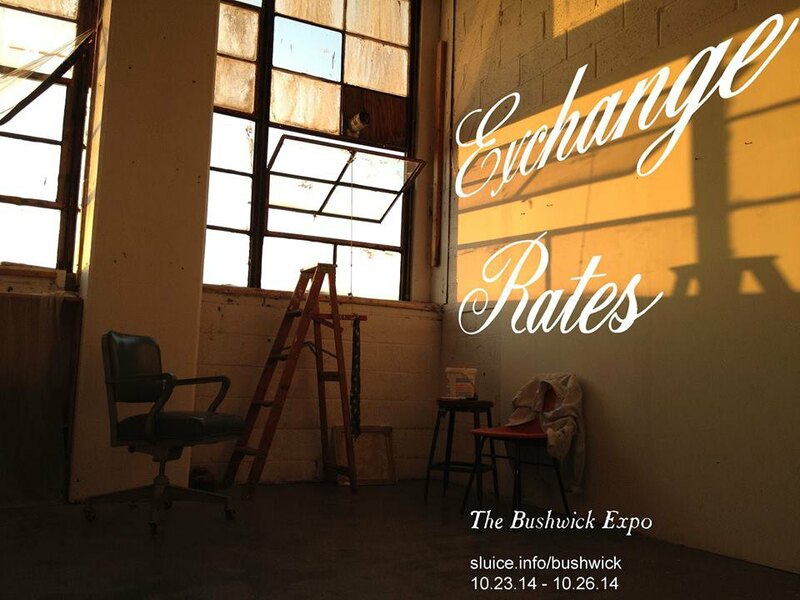 While other Bushwick-centric events like Bushwick Open Studios are all about the talent within the neighborhood, Exchange Rates is different. Bushwick galleries and pop-up spaces will play host to a number of International and national galleries and collectives. While galleries were paired based on different factors, including size and type of work that they show, there is still a bit left to chance for the matches, and each show will reflect the similarities, the differences, and possibly even the struggles of sharing a space with contrary curatorial voices. This is all part of the experiences- as their website says, "some exhibits will be integrated, some collaborative yet autonomous, some even spontaneous or virtual. The rates of exchange, as such, will fluctuate, while the currencies of exchange—ideas and culture—remain fixed." Beginning with a kick-off reception at Alaska on Thursday evening, the exhibitions and events throughout the weekend carry this sentiment of cultural exchange. Panel discussions, artist talks and workshops will confront hyperlocal issues for artist, such as Zoning 101, to more universal concepts that effect the global art community, like Art As News, Art in the News: New Forms of and Trends in Art Reading, Writing, Reviews, a discussion of the future of art news and reporting. By promoting discussion of the contemporary art world, beyond the going price for then next hot artist, Exchange Rates has the potential to be a true sharing of ideas across communities and international borders. On Friday, Jason Andrew and Norte Maar will present the 11th edition of Beat Nite featuring a special international edition to coincide with Exchange Rates. Beat Nite: Exchange Rates will celebrate the Bushwick late night from 6-10pm and will feature all the Bushwick based art spaces hosting international galleries and artists. Stay tuned later this week for Bushwick Daily's special art guide: Beat Nite edition! Exchange Rates opens on Thursday October 23, with a special reception hosted by Alaska, and runs through Sunday, October 26th. Check out their site for a full a full listing of participating spaces and events.